There are five major world religions: Hinduism, Buddhism, Christianity, Judaism, and Islam. They can be judged by any number of criteria. Which one has the most admirable superhero? There are certainly compelling characters in four of the five: Jesus is awesome on many levels; Buddha is calm, brave, and thoughtful; Arjuna is an emotionally complicated hippie-pacifist; and the writer of Ecclesiastes, playing the tormented existentialist, is one of the most compelling persons in the Hebrew Bible. Mohammad, unfortunately, doesn’t make it into the top-tier of admirable characters of any sort and so pretty much leaves Islam a dismal failure by admirable superhero standards. He’s simply too violent. Islam’s history is akin to if Christianity got its start with Constantine. It would be hard to admire Constantine as the founder of a religion, and it’s hard to admire Mohammad for the same reason. Mohammad does have one thing going for him over Jesus and the other nonviolent and internally tormented religious superheroes. At least Mohammad’s religion is honest about the role that coercion plays in the advance of religion. Mohammad was an actual political leader in a coarse and violent time (even more coarse and violent than ours), and so had to make hard calls and justify them–and he did. After his death, Jesus had his Constantine. Mohammad didn’t enjoy that luxury. Constantine did the dirty work for Jesus, securing as a world historical phenomenon the religion started by him (or more accurately, the religion started by the apostle Paul). Mohammad didn’t outsource, and so he gets direct blame for Islam’s subsequent acts of coercion and imperialism. Religious leaders like Jesus, Paul, and Buddha have plausible deniability on the coercion and imperialism fronts. This makes them more attractive and sympathetic figures than Mohammad. But that doesn’t change the fact that the religions that carry their imprint have gotten big pushes through history from political leaders and wealthy men expending their money, power, and tools of violence and coercion on their behalf (exactly like Islam has). And Moses and Joshua in Judaism and Arjuna in Hinduism also suffer from the same coercion problem that Mohammad does. Their embrace of violence (the invasion of Canaan in the Hebrew Bible; Krishna’s ultimate persuasion of the reluctant Arjuna to fight in a civil war in the Baghavad Gita) makes them hard, ultimately, to admire and imitate. Like jihad in the Koran, the violent acts in the Hebrew Bible and the Gita have to be deliteralized and turned into allegories of the inward struggle (as Gandhi did with the Gita) to make them tolerable and not repulsive for use in the 21st century. Jesus and Buddha, however, were pretty consistent in their nonviolence, and so can’t be as readily blamed for the behavior of all the subsequent dunderheads who claimed to follow them. Therefore, by the criterion of most admirable superheroes, Christianity and Buddhism get measured nods from me, and Islam, Judaism, and Hinduism get points for honesty. Where, however, are the heroines? A big thumbs down to all five religions for their long and sexist focus on the wiener. But there’s one other ancient superhero that certainly stands up well against Jesus and Buddha, but only if we count secularism, in its rise since the Enlightenment, as now among the world’s great and competing religions. I think secularism does qualify as a new and pervasive human religion if we accept Paul Tillich’s famous definition of religion as “the state of being grasped by an ultimate concern” (chapter 1 of Christianity and the Encounter of the World’s Religions, Columbia University Press, 1963). Most secular people have ultimate concerns (political or otherwise) that give their lives larger meanings other than the day-to-day and animate them in a religious manner. Secularism, in other words, has its humanist (and sometimes not so humanist) religions and causes. And that means secularism’s ur-hero deserves to be in play here. I’m referring of course to the archetypal man of doubt, Socrates. He denied that he really knew anything, and therefore, in contrast with the rest of pretentious humanity (including Jesus and Buddha), could readily be described as the wisest man in the world (and the oracle at Delphi did so). Socrates did not live in the error that he knew things that he actually didn’t, or that he had arrived at the One Right Path (as Jesus and Buddha had done). Instead, he asked questions, he deferred to reason, he stayed open. He declined the dubious bullhorn of proclamation for the gentle step-ladder of dialogue, and generally lived admirably, giving birth to a sane, non-neurotic, and profound intellectual lineage (Plato followed by Aristotle). His manner of death also showed him to have powerful inner resources–the inner resources of a superhero. So for me, with regard to the question–“Which religion has the most admirable superhero?”–secularism wins the big crown and Islam gets the biggest smile turned upside down. 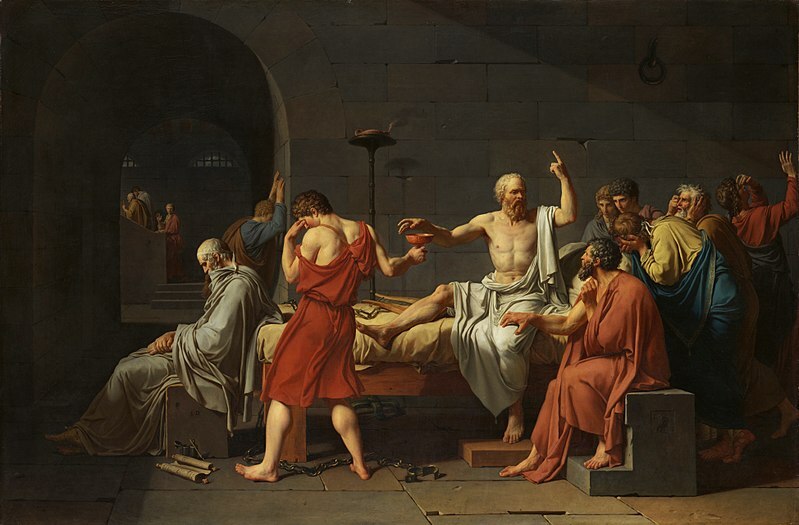 And here’s Jacques-Louis David’s famous 1787 canvas depicting Socrates, after having been condemned to death on grounds of denying the gods and corrupting the youth of Athens with doubt, willingly, bravely, and philosophically receiving from one of his students the cup of hemlock that would end his life. This entry was posted in Uncategorized and tagged Arjuna, atheism, Buddha, Christianity, God, Islam, Jesus, Judaism, philosophy, religion. Bookmark the permalink. One longs for a story promoting the idea that our conceptions of god and his role in our lives are varied and culturally determined, and that it is supercilious, to say the least, to assume that one faith is superior to another. Or better still: A story telling us that all deities have, finally, become as obsolete as floppy disks. hahaha I’m not up on all this technology stuff. I had to tape the instructions for the remote to the bottom side of it. I don’t really have much to add to this conversation. I just thought I’d say hello and that I really enjoyed this post. Haha. Great stuff! Next time I read a blog, I hope that it does not disappoint me as much as this particular one. After all, I know it was my choice to read through, but I truly believed you’d have something helpful to talk about. All I hear is a bunch of moaning about something you can fix if you were not too busy seeking attention.